For New Year’s Eve, Mozaic is offering a gala “Dinner Spectacle: A Night of Great Surprise!” with entertainment synchronized with the food and service for a great night of surprise! The food menu will focus on using local Indonesian ingredients and flavors prepared and presented with unusual techniques. Tasting menus of 6 or 8 courses will be offered with wine pairing option. 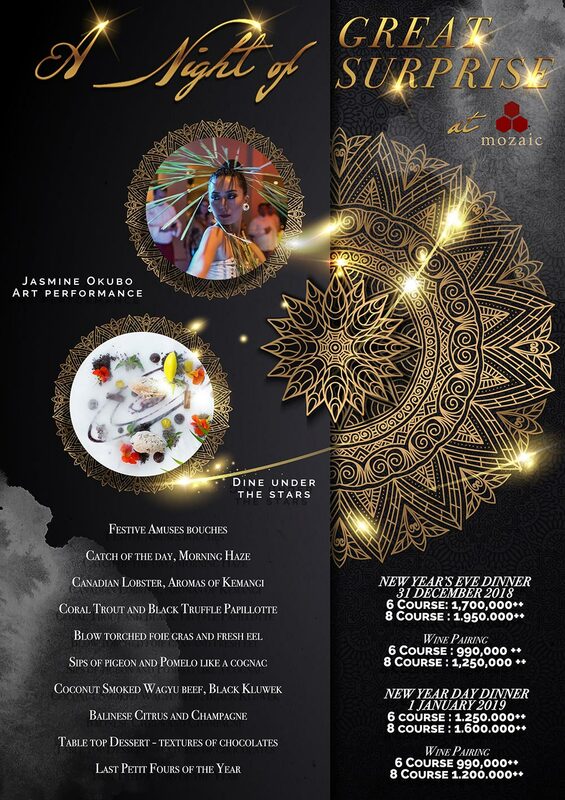 During dinner, the performing artist Jasmine Okubo and her band Kita Poleng will tune their performance to the theme of the food as it is served. Innovative and entertaining! Prices are 6-course Rp1,700,000++ and 8-course Rp1,950,000++ with premium wine pairings at 6 course Rp990,000++ and 8 course Rp1,250,000++.